15% Off All Essay Rockstar Short Courses! You are here: Home / Coupons and Deals / 15% Off All Essay Rockstar Short Courses! Fortuigence is a sponsor of Free Homeschool Deals. This post contains my referral link which helps support the work of this site. Here’s my full disclosure policy. 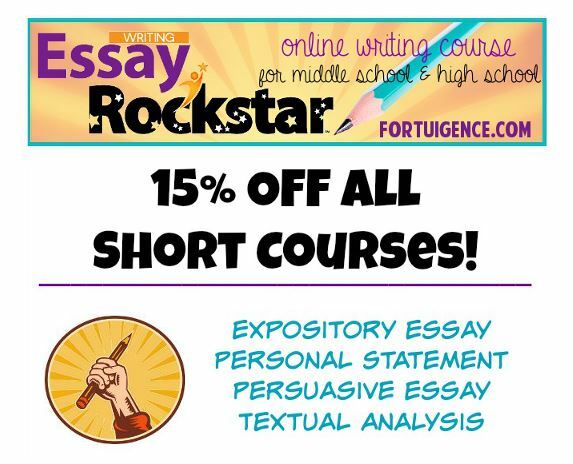 Today through 12/17/14, you can snag 15% off all Essay Rockstar short courses by Fortuigence when you use the exclusive coupon code FHD15 at checkout. Essay Rockstar consists of self-paced online writing courses for middle and high school students to master non-fiction writing skills. Expository Essay – The most common essay form that is often assigned in high school, college, and in the workplace. The purpose of an expository essay is to explain or inform an audience objectively about a specific subject. Personal Statment – College applications almost always require a “tell us about yourself” or personal statement essay. Persuasive Essay – The writing sections of most college entrance exams like the SAT (Scholastic Aptitude Test) require persuasive essay writing. Textual Analysis – Requires middle, high school and college students to write a review on someone else’s work. Book reviews, movie reviews, and product reviews are all examples of textual analysis essays. Interested in the full course? You can also use the coupon code to get 15% off the complete Essay Rockstar curriculum! Click here to see the full Essay Rockstar deal!